The Syrian Observatory for Human Rights said at least 43 people were killed. An image grab taken from an AFPTV video released on January 7, 2017 shows people gathering amidst the debris at the site of a car bomb attack in the rebel-held town of Azaz in northern Syria. According to the Syrian Observatory for Human Rights, at least 43 people were killed and dozens injured in the blast that ripped through the town near the Turkish border. A fuel truck exploded in the busy center of a rebel-held town near Syria’s border with Turkey on Saturday, killing dozens of people and wounding dozens more, several sources said. 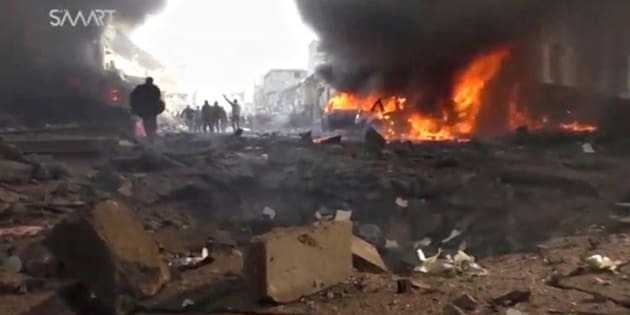 The Syrian Observatory for Human Rights said at least 43 people, mostly civilians, were killed when the tanker blew up in front of a courthouse in the northern Syrian town of Azaz. Dozens more had severe injuries, said the Observatory, which monitors the violence in the country. In unsourced comments, Turkey’s privately-owned Dogan news agency said a car bomb planted by Islamic State was responsible. There was no immediate claim of responsibility from the militant group. Turkey’s state-run Anadolu news agency cited a doctor in Azaz as saying at least 60 people had been killed and more than 50 wounded. An Azaz resident who went to the local hospital told Reuters he had counted around 30 bodies laid out. Syria’s nearly six-year war has create a patchwork of areas of control across the country, and Azaz is a major stronghold of the Turkish-backed Free Syrian Army (FSA). The FSA is an alliance of moderate rebel groups whose fighters have, with Turkish military support, pushed Islamic State militants out of the border area. Saturday’s explosion was heard across the border in the Turkish town of Kilis, Dogan said. Anadolu said 23 wounded people had been taken by ambulance to Kilis hospital, one of whom subsequently died. In a round-up of its military operations over the last 24 hours in support of rebels in northern Syria, the Turkish military said on Saturday that 21 Islamic State militants had been killed in clashes. Turkish warplanes destroyed buildings and vehicles in air strikes on 12 Islamic State targets, it said.